Sony Electronics used a major media event in New York on July 31th to unveil a new line of TVs dubbed the Master Series that will be offered in OLED and LED-LCD models. The TVs are designed to have picture quality that is as close as possible to the Sony X-300 RGB OLED professional monitor that is the mastering standard for most movie and episodic content today. Such audio and image quality is intended to elicit an emotional response, or ‘Kando’, as Sony likes to describe it. True to Sony form, very few specifications and technical details were provided to better understand how Sony accomplishes this level of performance. However, the peak brightness of the new versions seems similar to previous models and we were told the color gamut is actually wider than P3. The results are quite impressive, setting image quality high benchmarks that others will be envious of. Demonstrations of these capabilities were shown at CES. No new 8K TV products or super high brightness TVs (remember the 10K nit demo from CES?) were shown at the event. The Master series consists of the LED-LCD-based Z9F (in 65” and 75”), the successor to the Z9D and the OLED based A9F (in 55” and 65”), the successor to the A9E. In addition to the picture processing capabilities of the X1 Ultimate, which we will get into in a minute, Sony also announced a partnership with Netflix to offer a “Netflix Calibrated Mode” along with a partnership with Portrait Displays to offer an auto-calibration feature to speed up calibration when using the SpectraCal software. Sony makes the point that picture processing matters – that superior processing is visibly evident on identical panels. They are right about that. Some of the demos in the main presentation room showed content with and without some processing enabled on identical panels to prove this point. According to Sony, “The Picture Processor X1 Ultimate can intelligently detect and analyze each object in the picture through Sony’s new Object-based Super Resolution for exceptional accuracy and detail. The Object-based HDR remaster has been updated and now allows each object to be remastered individually for better depth, accurate texture and an overall more realistic picture.” According to one of the demo persons I spoke with, that means that, for example, individual grapes in a cluster of grapes can be independently processed for optimal image quality. That’s pretty incredible if true. In the formal presentations Sony pointed out its long history of leadership in video technology and the fact that they are involved in all aspects of the ecosystem – from lens to living room (a phrase they say they have focused on for 20 years). 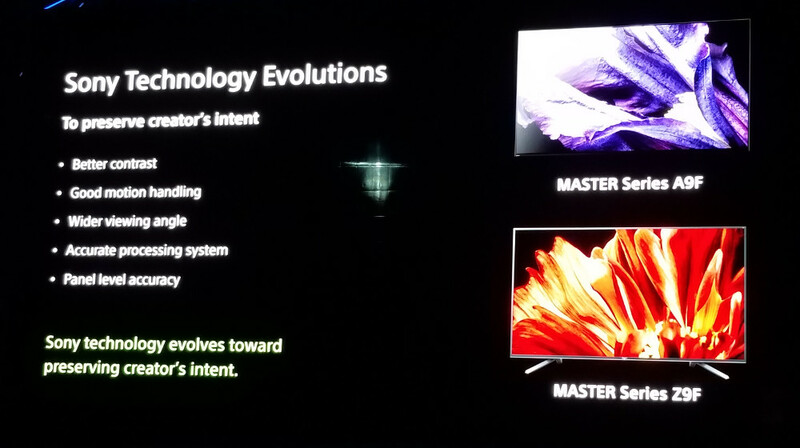 Sony says the new Z9F Master series has addressed the three main complaints about LCD technology: narrow viewing angles, motion blur and pixel contrast. The viewing angle improvement is actually quite remarkable with almost no drop off in contrast and brightness and no color shifts. How do they do this? Sony would only give the hint that it is a “structured optical element that is not a lens and not a film, but both.” BenQ Materials showed such structured films at DisplayWeek if you want to investigate further. (Display Glass and Plastic Roundup – subscription required). Motion response is improved via a smart blinking backlight technology. The idea is to identify areas of the picture that are moving and pulse the backlights in that area. Blinking (a kind of black frame insertion) improves motion response but can lower brightness. Sony compensates by boosting the backlight to maintain picture brightness. It works quite well, but I did see some ghosting artifacts on scrolling letters in the demo that were not evident on the blurry version without this processing. Pixel contrast refers to the full array local dimming implemented in the Z9D and Z9F. Sony does not state the number of zones but it is likely in the hundreds. But smart algorithms are also needed to get high pixel-to-pixel contrast as can be obtained with OLEDs. Following the presentations and demos, we had a chance to get dedicated demos in smaller rooms. For example, in the calibration room, we heard about improvements in the features of the Master series.These include an upgraded color management system (CMS) that has more adjustments that are now similar to what is offered on Sony’s home theater projectors. Gray scale calibration has been improved from 10-point to 20-point for more accuracy as well. The work with Portrait Displays is similar to what they have done with Samsung and LG with the ability to allow reviewers and calibrators to skip using the TV remote to change settings to perform the calibration. This can literally save hours in the calibration process. According the SpectraCal evangelist Tyler Pruitt, Sony does its calibrations in SDR mode to a Gamma 2.2 curve. HDR calibration is derived from this via mathematical transforms, so no separate HDR calibration is needed, saving more time. As mentioned earlier, there is also a new Netflix Calibrated Mode which appears to be a flag sent by Netflix to put the TV into a calibrated mode. User picture controls are disabled so you are supposed to see the content as the creator intended. Sony was clear that it does a very extensive factory calibration so that additional calibration is nice for that extra few percent for professional use, but is maybe not needed for most consumers. Any CalMan calibration will simply make the NetFlix mode and the Sony reference mode (now called custom mode instead of CinemaPro mode) more accurate. These TVs are so good that Sony hopes they will become the de facto client monitor in the production process as well. In the OLED room, we saw the A9E matched up against the LG E8. Here, the differences were quite subtle and almost all on dark scenes. Some slight hue shifts were pointed out by Sony with the implication that these can change the mood of the scene. That may be true for nit-picking colorists, but even savvy consumers would be hard-pressed to have their Kando altered. To me, the more objectionable minor difference was increased dark noise in the LG set. In the LED room, we saw a comparison of the Z9F vs. the Samsung Q9F. The first pattern was a moving ramp that showed some clear steps in the very darkest parts of the gray scale whereas the Sony one was very smooth. However, it also became evident that the Sony black level was much higher than the Samsung’s set, and the Samsung peak luminance was a bit higher as well. It may be that allocating 10-bits over this wider range was simply not enough in the Samsung set, but with the raised blacks in the Sony set, 10 bits was sufficient to not reveal any contouring. The final room was for sound. Here, Sony noted they have added a second sub-woofer and a third sound actuator to the back of the AF9 OLED panel. They have redesigned the actuator packages as well to make them more robust with a wider frequency range. This allows the middle actuator (actually two actuators per channel) to act as a center speaker so dialog can emanate from this area for better localization with moving lips (as in a cinema). This center channel can also be connected to a conventional home theater system. To demonstrate the system, they showed clips that used a direct comparison with the actuator-based TV center channel vs. a center channel speaker placed below the screen. The below-the-screen speaker definitely sounded as though it came from below the TV while the actuator solution was definitely higher (I actually thought it was too high on one clip). The design is also a bit different from other previous implementations as the sound is more side-firing rather than rear-firing. Overall, the sound quality was much better than I was anticipating and quite acceptable. The Master Series A9F and Z9F will be available across North America in the fall of 2018, with pricing and retail availability to be announced later. The Master series definitely sets a high bar in image quality. 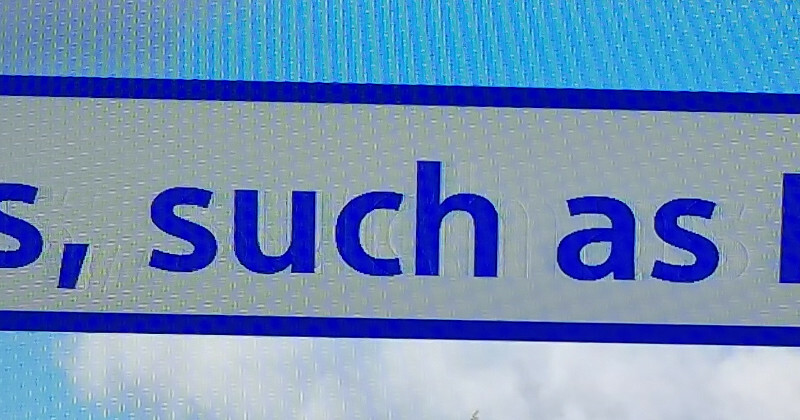 Good job Sony.